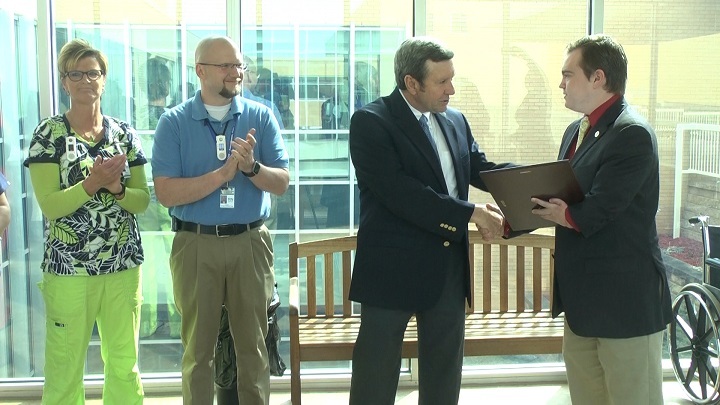 IRON MOUNTAIN — State Representative Beau LaFave delivered a Special Tribute Certificate to the intensive care unit at Dickinson County Memorial Hospital Friday morning. LaFave said that the certificate recognizes the amount of expertise the hospital staff has in fields that regional hospitals normally do not deal with and the quality of care their patients receive. The manager of the intensive care unit, Trenton Rankin, said that teamwork has helped make the department so successful. “It validates the excellent care that our nurses, our providers, our ancillary staff working together to give the best care that we can give to our patients,” said Trenton Rankin, manager of the Critical/Intensive Care Unit and Pool. Dickinson County Healthcare Systems Administrator/CEO John Schon said that the hospital is a high quality operation with a great staff. “They care for this community, just like they’re family. I think that really is the difference. We have a lot of dedicated people throughout the organization,” he said. Rep. LaFave said that because of the staff at Dickinson Memorial Hospital, his grandfather lived to be the oldest living juvenile diabetic in the country. “I have no doubt in my mind that my grandfather would have passed 25 years ago instead of last year had it not been for the excellent care at Dickinson County Memorial Hospital, specifically in the intensive care unit,” said LaFave. This distinction comes just days after the Dickinson County Healthcare System received another “A” grade from the Leapfrog Hospital Safety Grades list.